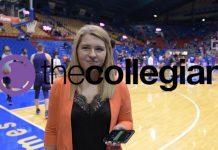 After a disappointing home conference debut in a loss against Baylor, K-State volleyball will look to bounce back against its in-state rivals, Kansas. The match snapped an 11-game winning streak, but head coach Suzie Fritz’s bunch is ready to right the ship in Lawrence. First serve for the Sunflower Showdown on Wednesday will take place at 6:30 p.m. in the Horejsi Family Athletics Center. The Wildcats will need to quickly forget what took place on Saturday at Ahearn Field House. The Bears played without their top scorer in junior outside hitter Andie Malloy and were led by Big 12 Rookie of the Week, outside hitter Katie Staiger. The freshman led all players with 20 kills and had four blocks. However, K-State will need continued success from its top scoring duo. 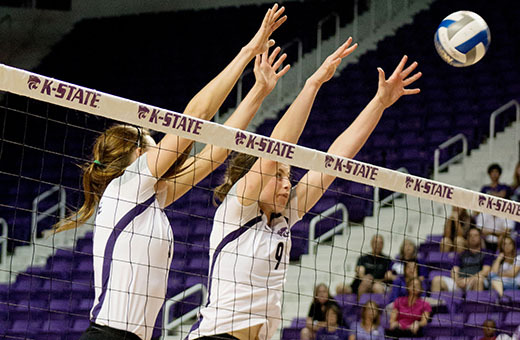 Fritz’s squad had strong performances from outside hitter Kylee Zumach, who led K-State with 18 kills and four blocks. Along with the standout freshman, sophomore outside hitter Brooke Sassin had 14 kills and five blocks against the Bears. 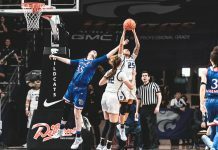 For Wednesday, the Wildcats will take on a Jayhawk team that dropped its first Big 12 game in a five-set battle with Oklahoma. The Jayhawks are led by senior outside hitter Chelsea Albers, who leads her team with 172 kills and 44 blocks. Sophomore libero Cassie Wait has 255 digs, which ranks second in the Big 12. Defensively, the Jayhawks are led by freshman middle blocker Kayla Cheadle and her 45 blocks. Kansas is led by Ray Bechard, who is in his 17th year as head coach. One of the program’s three losses came at the hands of No. 3 Penn State in three sets. They are also ranked in the top five in the Big 12 in multiple categories, including hitting percentage, opponents hitting percentage, assists, kills and digs.